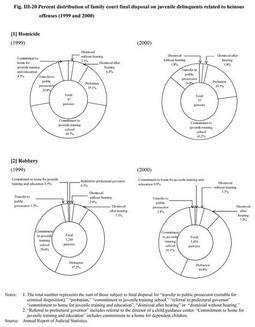 White paper on crime 2001 Part3/Chap.2/Sec.2/2. Fig. III-18 shows the trends of the number of persons received by family courts for juvenile cases for the past 10 years. Trends are shown separately for general cases and road traffic cases (juvenile cases related to road traffic violations). The total number received in 2000 was 283,389, a slight decline by 14,116 (4.7%) from the previous year, for the number received for general cases and the number received for road traffic cases. Fig. III-19 shows the details of the final disposal of family courts in 1999 and 2000 for juvenile cases other than those involving professional negligence in traffic accidents, road traffic violations and status offenses (see Appendix III-10 ). Both in 1999 and 2000, the dismissal without hearing had the largest share (over 70%), followed by the dismissal after hearing (over 10%), the protective measures such as probation, commitment to juvenile training school, etc. (15.0% in 1999, and 18.0% in 2000). Fig. III-20 shows the details of family court final disposal on juvenile delinquents related to homicide, and robbery in 1999 and 2000. As for homicide, compared with the details of the final disposal of juvenile cases excluding professional negligence in traffic accidents, road traffic violations and status offenses, the percent distribution of transfer to public prosecutors and commitment to juvenile training schools was much higher both in 1999 and 2000. As for robbery, the percent distribution of probation and commitment to juvenile training schools was almost 90% both in 1999 and 2000. Compared with the details of the final disposal of juvenile cases excluding professional negligence in traffic accidents, road traffic violations and status offenses, the percent distribution of transfer to public prosecutors was higher. Fig. 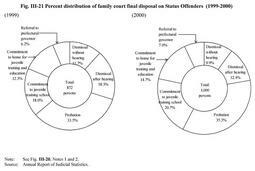 III-21 shows details of family court final disposal on status offenders in 1999 and 2000. Compared with details of the final disposal of juvenile cases excluding professional negligence in traffic accidents, road traffic violations and status offenses, the percent distribution of probation and commitment to juvenile training school was higher both in 1999 and 2000.